Even the entrance is interactive: open the cover and flick through the pages to enter the exhibition. Copyright Vic Frankowski. Moomins — those surreal hippo-like creatures we remember from our childhood — are back. 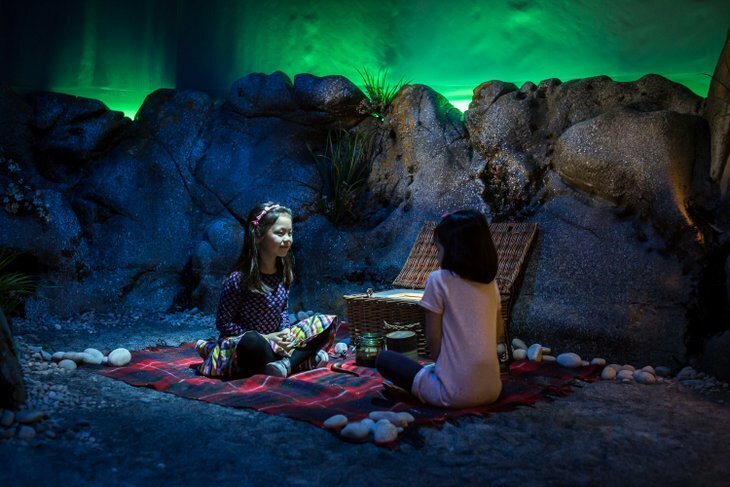 This time in an interactive exhibition aimed at children... and it's a whole load of fun. 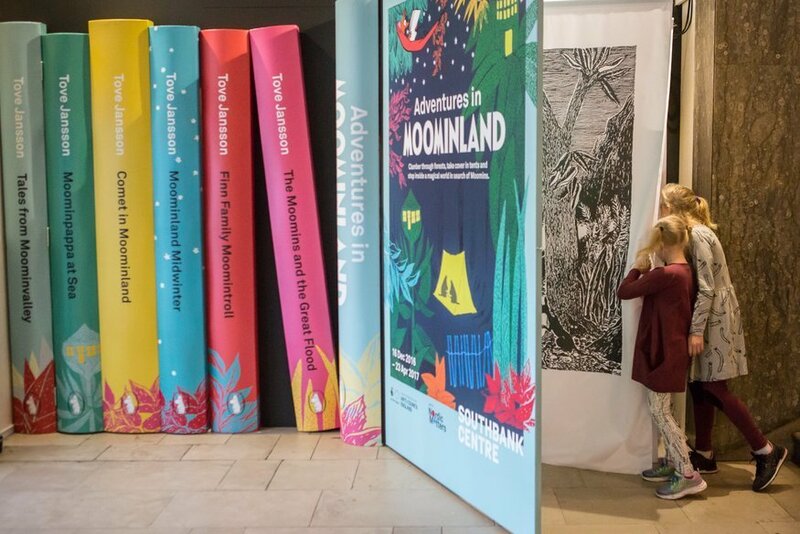 Unlike the usual exhibition layout where you read labels and look at artworks, here an enthusiastic guide leads small parties through a 50-minute Moomin-tastic journey. Cases of archive material are scattered throughout the sets. Copyright Vic Frankowski. Adventures in Moominland charts the invention of the Moomins, and the life of their creator Tove Jansson, through archive materials and original drawings. The original 'Moomintroll', it turns out, derives from a story told to Jansson by her uncle. Rather than presenting the story in sterile vitrines, the Royal Festival Hall makes you navigate recreations of forests, tents and seaside scenes. Each section is narrated by Sandy Toksvig — her delivery engaging as ever. 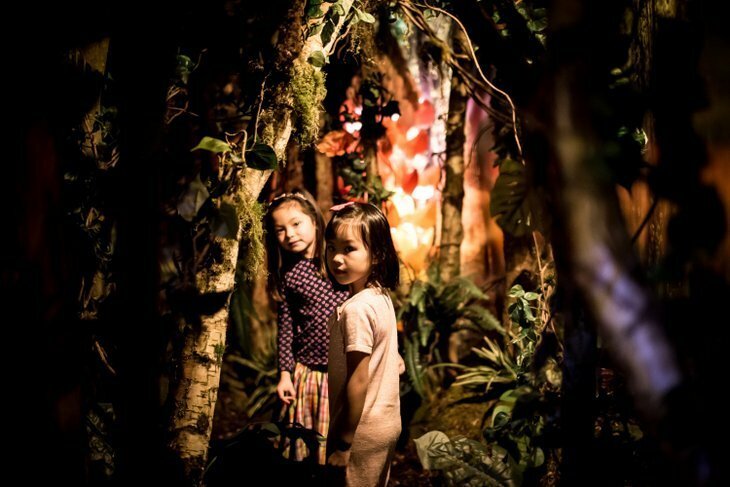 Children and adults have to navigate through a dense, steamy forest. Copyright Vic Frankowski. There are secret doors, sandy floors and hidden doorways that will get children bubbling over with excitement. Plus, you get to draw your own Moomin at the end. The set design is spectacular (and, let's be honest, explains the ticket prices). 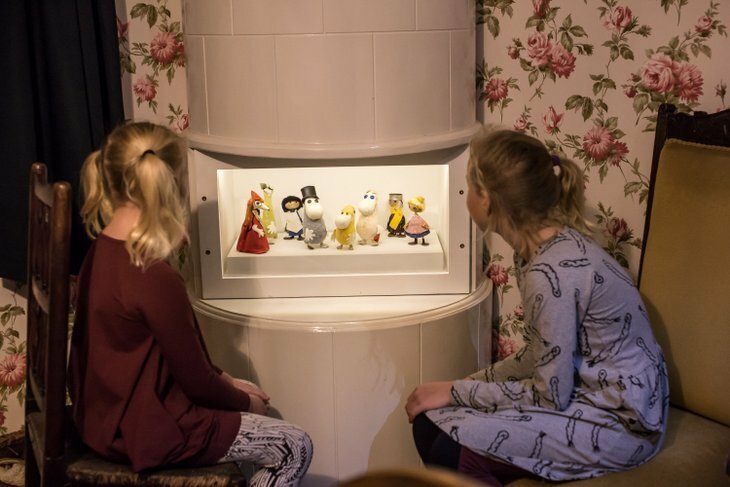 This exhibition is squarely aimed at getting the new generation of children to fall in love with Moomins — just as their parents and grandparents did before — and it does a fantastic job. Sit down and listen to the narrative and then search for the hidden entrance to the next section. Copyright Vic Frankowski. Adventures in Moominland is recommended for children over seven — sensible advice as younger children may struggle to remain focused for the duration — and there are some mildly scary moments in the narrative. As there are only 16 people per tour we strongly advise booking in advance. There are some moments which younger children may find scary — such as the surprise waiting in the night time forest. Copyright Vic Frankowski. 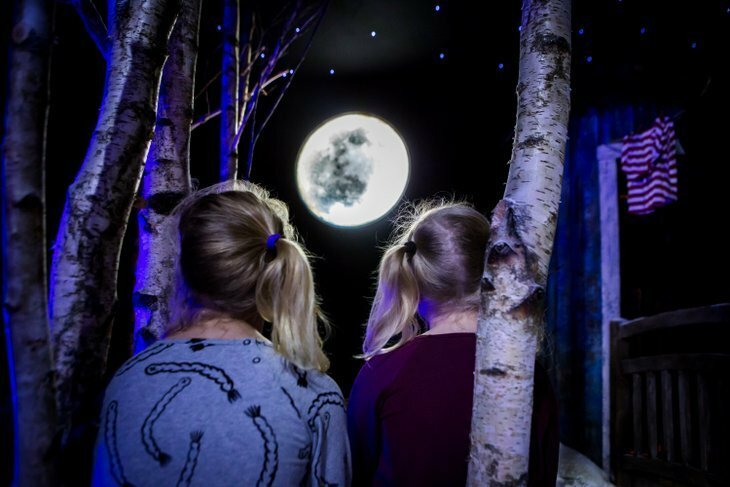 Adventures in Moominland is on at Royal Festival Hall until 23 April 2017. Tickets range from £13.50 to £16.50.